Finland right wing JANNE PESONEN (20) of Russian Kontinental Hockey League club Ak Bars Kazan, the 30-year-old veteran who racked up 32 goals to go along with 82 points in 70 American Hockey League games for the Scranton/Wilkes-Barre Penguins during the 2008/09 campaign, watches as Germany goaltender ROB ZEPP (72) of Deutsche Eishockey Liga champion Eisbaeren Berlin secures the puck in his glove during the 2013 IIHF World Championships – Group H contest at the Hartwall Arena in Helsinki, Finland. 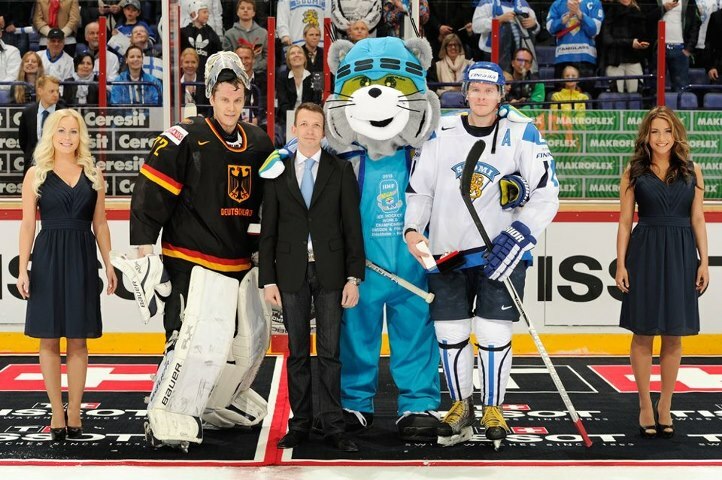 Despite skating shorthanded for the equivalent of three-quarters of an entire period, embattled GERMANY came within a minute and a half of defeating host FINLAND for the first time at a major international tournament in twenty years before eventually falling 4-3 after extra time in the opening match for both sides at the 2013 IIHF World Championships. There is little question that the national team program of Germany is under the proverbial microscope after failing to qualify for the men’s ice hockey tournament at the XXII Winter Olympic Games to be held next year in Sochi, Russia. Against the host Finns at the Hartwall Arena, the Germans certainly came under heavy scrutiny from the match officials, who ended up assessing Canadian-Italian legionnaire trainer PAT CORTINA’s charges no fewer than nine minor penalties. Germany might have also fared better with more luck from the goal post in Helsinki, as well. Nevertheless, Germany still earned what could prove to be a very significant point in the Group H standings against Finland and, perhaps more importantly, generated a certain amount of confidence and optimism not just among the national team players, but, indeed, the people of Deutschland, as well. Finland trainer JUKKA JALONEN, who has been in charge of the national team since the beginning of the 2008/09 campaign, returns only six skaters and no goaltenders from the squad that lost the bronze medal match at home in Helsinki to the Czech Republic last season. Jalonen, who steered Suomi to the gold medal triumph at the 2011 IIHF World Champinoships in Slovakia and sports a career record of 26 wins and 13 losses behind the bench for Finland at major international tournaments, has only one National Hockey League player on his roster at the 2013 IIHF World Championships but has left two places open. Forward LAURI KORPIKOSKI, the first round pick (# 19 overall) of the New York Rangers at the 2009 NHL Draft who has scored 42 goals in 197 NHL games the past three seasons for the Phoenix Coyotes, did not dress for the opening contest with Germany. PETRI KONTIOLA of Russian Kontinental Hockey League club Traktor Chelyabinsk, the 28-year-old center who skated a dozen NHL games a collected five assists for the Chicago Black Hawks during the 2007/08 campaign, sent the Finns to the lead with a power play goal roughly ten and a half minutes into the contest after taking a cross-ice pass from JUHA-MATTI AALTONEN of Swedish Elitserien side BK Rogle Angelholm and slamming the puck into a wide open net. But the Germans were able to equalize halfway through the match when center MARCEL GOC of the Florida Panthers, one of the two NHL players in Deutschland’s line-up, picked out FELIX SCHUETZ of Koelner Haie all alone in front of the net; quick stickhandlilng enabled the 26-year-old right wing, who spent two seasons skating for the Portland Pirates in the American Hockey League before signing with ERC Ingolstadt in the summer of 2010, to fake out Finland netminder JONI ORTIO, the Calgary Flames prospect who spent this past term out on loan with IFK Helsinki, and register his sixth career goal for Germany at a major international event. Germany right wing FELIX SCHUETZ (55), the fourth round selection (# 110 overall) of the Buffalo Sabres at the 2006 NHL Draft, tied for the Koelner Haie team lead with 23 goals and finished second with 41 points in 50 Deutsche Eishockey Liga contests this season. The Germans continued with their parade to the penalty box in the latter half of the second period, however, and Finland were, once again, able to capitalize with just over half a minute to skate before the second intermission. Right wing JANNE PESONEN of Russian KHL club Ak Bars Kazan, who appeared in seven NHL games for the Pittsburgh Penguins during the 2008/09 season, did very well to redirect the point shot from defenseman JUUSO HIETANEN of Russian KHL club Torpedo Nizhny Novgorod. The Finns might have had a few more goals, though, were it not for the 22 saves that Germany netminder ROB ZEPP of Eisbaeren Berlin, the 31-year-old naturalized Canadian who spent two years with Finnish elite league side Saipa Lappeenranta after leaving the Florida Everblades of the East Coast Hockey League in the summer of 2005, recorded in the first forty minutes of play. Despite being heavily outshot, the Germans hauled themselves level yet again only two seconds after veteran defenseman OSSI VAANANEN of Jokerit Helsinki, the highly experienced 32-year-old who skated 479 NHL games for the Phoenix Coyotes, Colorado Avalance and Philadelphia Flyers and is appearing for Finland at his ninth major international tournament, was sent off for holding early in the third period. Goc won the ensuing faceoff cleanly and NHL colleague CHRISTIAN EHRHOFF of the Buffalo Sabres blasted a rocket right past Ortio, the 22-year-old youngster who was representing Finland at a major international event for the very first time ever, to net his fifth career goal for Germany in a major international tournament. Germany’s star NHL defenseman CHRISTIAN EHRHOFF (10) of the Buffalo Sabres is pestered by Finland center JUKKA-PEKKA HYTONEN (15) of Russian KHL club Amur Khabarovsk behind the net during the 2013 IIHF World Championships – Group H contest at the Hartwall Arena in Helsinki. Deutschland looked to be in great shape after defenseman TORSTEN ANKERT of Koelner Haie, one of three German blueliners who are appearing at a major international tournament for the first time in their careers, found the back of the net with a long, low drive from the right point. Indeed, Germany were only a little over three minutes away from upending stubborn Finland at a major international event for the first time since the 1993 IIHF World Championships in Moscow. But, alas, it was not to be. The skillful Kontiola made a sensational play to bat the puck out of the air, baseball-style, at the side of the net and then swoop out in front to slot the black disc past the bamboozled German goaltender with a little less than a minute and a half remaining in regulation time. Goc was then boxed for tripping only just before the sixty minutes had expired, which meant that Germany were forced to start the overtime period with just three skaters defending against the Finns’ four. Just after the penalty expired, 24-year-old winger SAKARI SALMINEN of Kalpa Kuopio skated into the left faceoff circle and rifled a wrist shot that 27-year old winger VELI-MATTI SAVINAINEN of Assat Pori was able to deflect ever so slightly. Germany had battled like a champion, nonetheless, in its first meaningful international match since the historic Olympic qualification debacle. Notes — new captain CHRISTIAN EHRHOFF logged 29:30 minutes of ice time for Germany, including 10:36 of the last period and all but two seconds of the overtime session … MARCEL GOC, who totaled 19:54 of ice time, assisted on all three German goals and, in doing so, posted a career high for points in one game at a major international tournament. The official record of the old Deutsche Demokratische Republik (commonly known as East Germany) against Finland at major international tournaments was eight wins against ten losses with one draw. 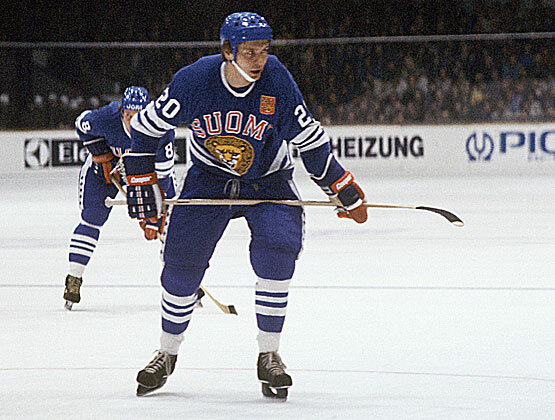 MATTI RAUTIAINEN, who played for three Tampere city clubs of Koo Vee, Ilves and Tappara in the Finnish elite league over the course of his 15-year career, only ever represented the national team of Finland at four major international tournaments (28 games, 12 goals) from 1976 thru 1979. The Opening Ceremony at the historic Bergiselstadion to formally initiate the proceedings at the 1976 Winter Olympics was still a day in coming but the ice hockey competition for the Innsbruck Games was already well underway inside the Olympiahalle … three more places for the medal round had yet to be determined as FINLAND and JAPAN prepared to drop the puck and start the second day of play in the qualification round. Whereas the Finns were legitimate contenders to fashion at least a bronze medal, the Japanese arrived in the Austrian Alps seeded 10th out of 12 teams competing at the ’76 Innsbruck Games. Still, the underdogs on skates from the Land of the Rising Sun succeed in getting the audience’s attention at the Olympiahalle by holding Finland scoreless for the first 20 minutes of the match. Furthermore, Japan had actually gone in front thanks to a goal by HIDEO URABE of Oji Seishi Tomakomai with a little over two and a half minutes remaining in the opening session. 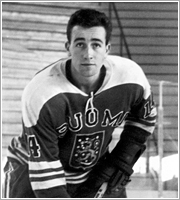 20-year-old MATTI RAUTIAINEN of Koo Vee Tampere, one of six players on trainer SEPPO LIITSOLA’s 18-man roster making their debut for Finland at a major international tournament, restored a measure of order for Suomi by equalizing two minutes into the second period. But, amazing enough, the Japanese continued to stay even with their more accomplished adversaries until half of the qualification contest had come and gone. At this point, though, the Finns awoke from their slumber to net three goals in as many minutes via PERTTI KOIVULAHTI of Tappara Tampere and two more from Rautiainen, both set up by 1975 Boston Bruins draft pick MATTI HAGMAN of IFK Helsinki. JORMA VEHMANEN, who spent almost all of his career with Lukko Rauma (right) save one season with HJK Helsinki (73/74), appeared at ten major international tournaments (70 ga, 10 go, 18 pts) for Suomi from 1966 thru 1976; altogether, Vehmanen contested 175 games and counted 36 goals for the national team of Finland over the course of his career. Still another rookie, 23-year-old TAPIO KOSKINEN of Assat Pori, capped off the five-goal outburst which opened the final frame with his second strike at 48:04 as Rautiainen, yet again, HENRY LEPPA of Jokerit Helsinki and 30-year-old veteran JORMA VEHMANEN of Lukko Rauma all put their names on the scoresheet in the third period at the Olympiahalle, as well. MINORU ITO of Iwakura Tomakomai, appearing at the ice hockey competition of the Winter Games for the third time in his career, added a second goal for Japan with eight minutes to go but this would not prevent the Finns from finally reaching double digits in the waning stages as the ambitious Rautiainen registered his fifth goal of this Olympic qualification contest while Vehmanen notched his second with two minutes remaining to leave the final result at 11-2. Finland, as expected, moved forward into the final round for the medals at the ’76 Innsbruck Games. ESA PELTONEN (12) utimately appeared at the Winter Olympic Games on four occasions and ended his career as the second-best ever for FINLAND at major international events having totaled 53 points (37 go, 26 as), just two goals shy of matching all-time leader Lasse Oksanen’s exact scoring record. No team at the ice hockey tournament of the 1976 Winter Games was, perhaps, more excited by the decision of both Canada and Sweden to skip the Olympics as a result of inability to ice professional players than FINLAND. 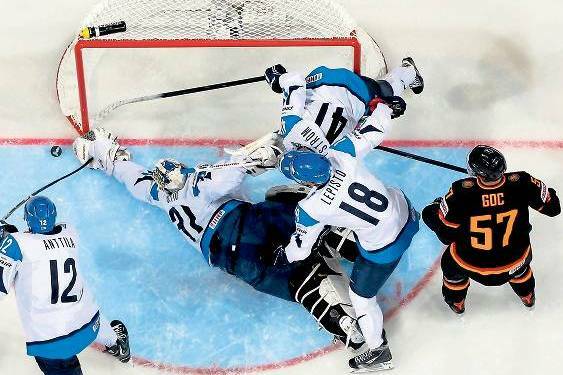 Indeed, the Finns had finished in fourth place for the past seven consecutive years at the annual IIHF World Championships now. Common sense dictated that, in the absence of the Canadians and Swedes, the skaters of SUOMI had the inside track on a first-ever finish in the top three at a major international event in the nation’s history. SEPPO LIITSOLA, who had guided Finland to a legendary upset of the Soviet Union at Moscow’s Christmas-time Izvestia Cup in December of 1971 during his first tour of duty with the national team, made wholesale changes to his squad which had finished level with arch-rival Sweden on points at the 1975 IIHF World Championships in West Germany but surrendered the set of bronze medals by virtue of inferior goal differential. Some of the roster moves were mandated when three top players — forwards LAURI MONONEN and JUHA TAMMINEN as well as defenseman PEKKA RAUTAKALLIO — crossed the Atlantic Ocean to sign professional contracts to play the 75/76 season in the World Hockey Association. Others, such as the omission of 33-year-old national team veteran LASSE OKSANEN, Finland’s leading scorer at the last World Championships who was now turning out for Italian side HC Gardena, in addition to that of TPS Turku center SEPPO REPO, the 28-year-old whose five goals at the ’75 WC tied for second most on the team, and IFK Helsinki winger HARRI LINNONMAA, the 29-year-old whose six points (4 go, 2 as) in West Germany tied for third-best on the squad, came as a result of the proverbial “coach’s decision”. 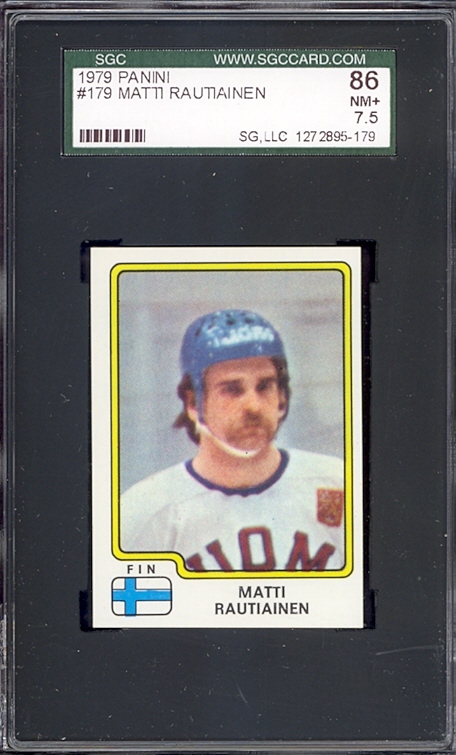 No less than one-third of Finland’s 18-man roster at the 1976 Winter Olympics were rookies who had never before participated in a major international tourney. MATTI HAGMAN (20) was one of the very first Finnish players to ever be tabbed by a National Hockey League team when the Boston Bruins chose the IFK Helsinki center in the 6th round (# 104 overall) of the 1975 NHL Draft. The rival New England Whalers of the World Hockey Association rated Hagman even higher and picked the youngster in the 3rd round (# 43 overall) of the WHA proceedings that same year. 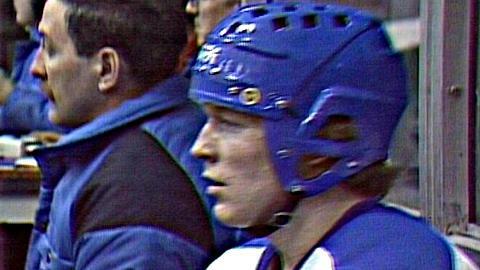 Hagman, who also later skated with Wayne Gretzky and the Edmonton Oilers, would become the very first player from Finland to ever compete in the Stanley Cup Finals when the Boston Bruins battled the Montreal Canadiens in 1977. 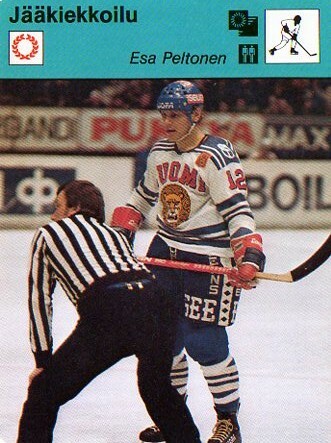 One player at the ’76 Innsbruck Games to whom Liitsola was looking for both experience and skill was 28-year-old IFK Helsinki forward ESA PELTONEN, the would-be four-time Olympian who had missed the last World Championships in West Germany on account of injury. Another was Peltonen’s teammate with the Finnish capital city club, MATTI MURTO, the 26-year-old winger who had spent the 74/75 campaign with VEU Feldkirch in the Austrian Bundesliga. The rising star was IFK Helsinki center MATTI HAGMAN, the 20-year-old NHL draft choice who had debuted as a teenager at the ’75 WC and had collected five points (2 go, 3 as) in nine contests played. Tappara Tampere rearguard PEKKA MARJAMAKI had put on an outstanding performance at the annual global tournament in West Germany by scoring six goals to lead Finland and was selected both an All-Star by the accredited media as well as Best Defenseman by the IIHF Directorate. 34-year-old blueliner SEPPO LINDSTROM, the former SC Berlin legionnaire now with 1976 Finnish domestic champion TPS Turku, was competing at his third Winter Olympics. The number one netminder for the Finns at Innsbruck figured to be ANTTI LEPPANEN of Tappara Tampere, the 28-year-old who had started seven of Suomi’s ten games at the 1975 World Championships. The Finns, for their part, saw the Bundesrepublik Deutschland as their biggest rival to attaining the goal of an Olympic bronze medal at the minimum. The United States, with its so-called “university” team, was viewed as less of a threat in Liitsola’s country. Of course, there was always the chance that Finland might rise up and ambush the Czechoslovaks, as had already happened at the IIHF World Championships in both 1970 and 1974. 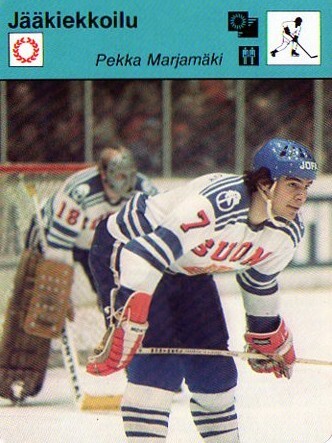 PEKKA MARJAMAKI (7), who spent most his time with Tappara Tampere but did skate two seasons with HV 71 Jonkoeping in the Swedish top flight, still holds a share of the all-time mark for Finland defenseman having shot 17 goals at major international tournaments over the course of his accomplished career. JIRI HOLECEK (2) is easily one of the most accomplished goaltenders in the history of international hockey. Holecek captured three titles ('72, '76, '77) at the annual IIHF World Championships for Czechoslovakia and was chosen to the media All-Star team five times ('71, '72, '73, '76, '78). Perhaps Finland had saved some of the spark from their 4-3 upset victory over Sweden on the final day at the 1972 Winter Olympics in Sapporo. Or maybe it was MATTI RAUTIANEN’s five goals versus Japan in their qualification game at Innsbruck that had fired up the Finns. Whatever the case, Finland certainly put forth a concentrated effort against powerful Czechoslovakia on the opening day of final round-robin play at the 1976 Winter Olympics in Austria. Forty-seven shots in all Suomi fired at their opponent’s goal. 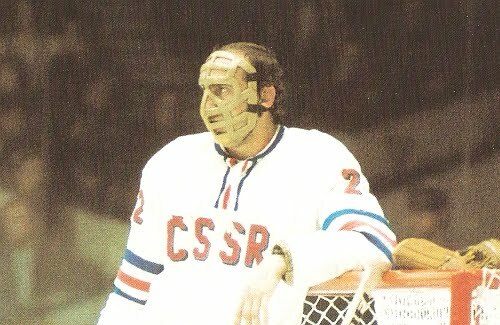 Unfortunately for the Finns, standing in front of the Czechoslovak net was none other than JIRI HOLECEK. The 31-year-old veteran international was already a three-time winner (’71, ’73, ’75) of the IIHF Directorate’s award for Best Goalie at the annual World Championships. PERTTI KOIVULAHTI was the only Finn who would manage to put a puck past the Sparta Prague goaltender. Holecek handled the other 46 shots effectively as JIRI NOVAK’s two goals helped the Czechoslovaks avert a major disaster derailing their bid to challenge the Soviet Union for gold medal supremacy at Innsbruck. Holecek handed in a clean sheet for Czechoslovakia’s next match, a 5-0 defeat of the United States, to follow up. That would turn out to be the only shutout registered by any of the six teams in the final round-robin at the 1976 Winter Olympic Games. JIRI HOLECEK would collect two more Best Goalie awards at the annual IIHF World Championships, in 1976 and 1978, and finished his career with an all-time high of five such selections. 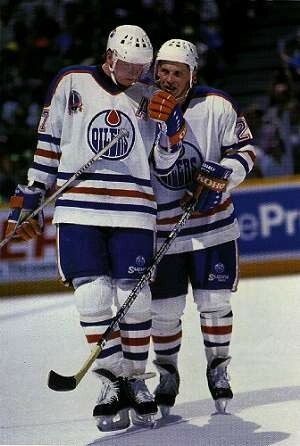 REIJO RUOTSALAINEN (29), right, confers with fellow Finn JARI KURRI (17) for the powerhouse Edmonton Oilers of the National Hockey League. 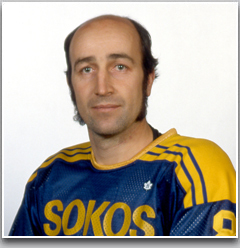 Ruotsalainen joined the Oilers in the spring of 1987 after spending the winter with SC Bern in Switzerland. The smooth-skating rearguard rejoined the Oilers in the spring of 1990 after a trade from the New Jersey Devils just in time to capture a second Stanley Cup with Edmonton. FINLAND had come to Calgary in 1988 with perhaps their strongest Olympic team yet. The Finns were featuring six former National Hockey League players including one-time New York Rangers All-Star defenseman REIJO RUOTSALAINEN. Ruotsalainen, 27, had hoisted the Stanley Cup with Wayne Gretzky and the empirical Edmonton Oilers just nine months earlier. SWITZERLAND, in some respects, were just happy to have the opportunity to skate at the Olympic finals in Alberta. Even though the competition had been expanded to twelve teams eight years earlier, Switzerland’s appearance at the Calgary Games marked their ice hockey team’s first Winter Olympics since 1964. What’s more, the Swiss had lost all ten of their games at the 1987 IIHF World Championships A pool in Vienna the previous spring and had been immediately demoted right back down to the B pool for the following tournament. If nothing else for the Swiss, events in Austria did foreshadow what lay ahead in Alberta for the Finns, however. In the first of two meetings the spring of 1987 at Vienna, Finland unleashed a relentless 84-shot barrage upon Switzerland’s goal. Standing tall between the sticks, Swiss goaltender OLIVER ANKEN was undaunted, however. Although Finland ended up on top 3-2, it was Anken’s astonishing 81 saves that fashioned the all the attention and rightly so. At Calgary the following winter, the Finns and Swiss faced off once again on the opening day of Group B play in the round-robin. This time around, Switzerland scored twice thru PETER JAKS and JAKOB KOELLIKER within the game’s initial eight minutes and in spite of just five shots for the opening twenty minutes. For the whole of contest, actually, the Swiss would officially generate only fifteen efforts on the Finnish goal. The balance of the story is on the account of Switzerland’s goaltender, RICHARD BUCHER. Finland did get one goal back roughly four minutes into the third period and applied furious pressure the rest of the way, but, in all, Bucher was able to block 32 pucks as Switzerland skated off 2-1 victors. As a testament to the genuine quality of their squad in 1988, it was the Finns who ultimately went home with the set of silver medals for the ice hockey competition at Calgary.